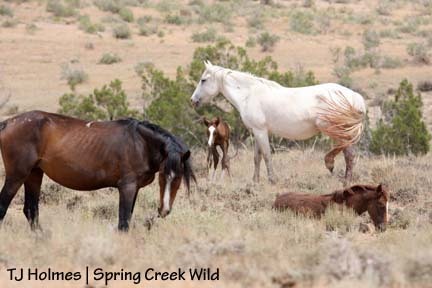 I guess even the government can’t control the BLM; despite the letter sent by U.S. Rep. Nick Rahall (chairman of the Committee on Natural Resources), the tone of the article seems to be that the BLM is plowing ahead with plans to “euthanize” wild horses or send them to slaughterhouses. None in America? Guess they’ll go to Canada or Mexico. 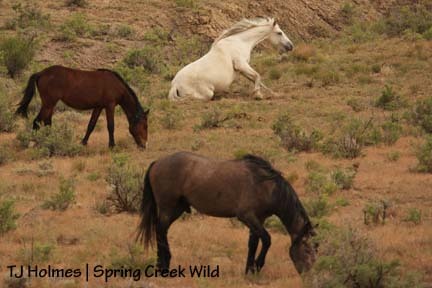 The article also says three roundups are planned this fall in Colorado. 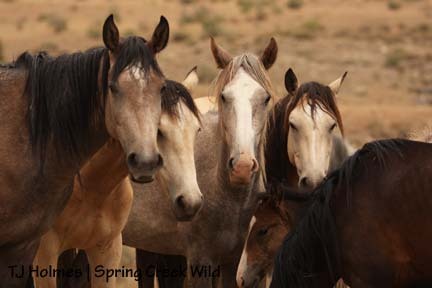 Sand Wash Basin was supposed to have a roundup (we are/were supposed to get three mares from that herd (for genetic viability) because we didn’t get them after the Little Book Cliffs roundup last fall after ours), but it apparently isn’t funded (I still don’t understand that? 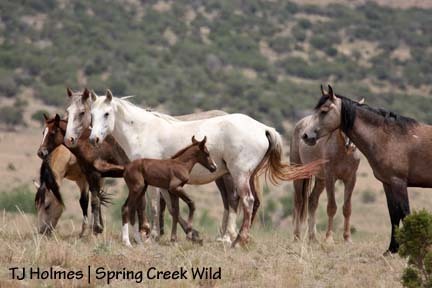 ), and the West Douglas Creek horses are scheduled to be “zeroed out” because of oil and gas drilling. Where’s the other roundup? 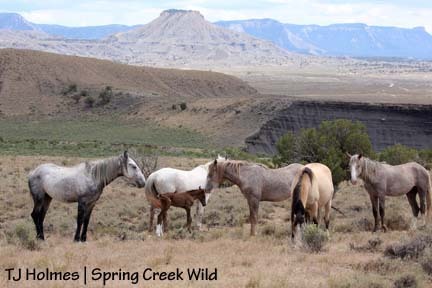 Roundups also are being planned in the McCullough Peaks Herd Management Area outside Cody, Wyo., and on the Pryor Mountain Wild Horse Range in northern Wyoming and southern Montana (just ones I know about). Where are those horses going to go? 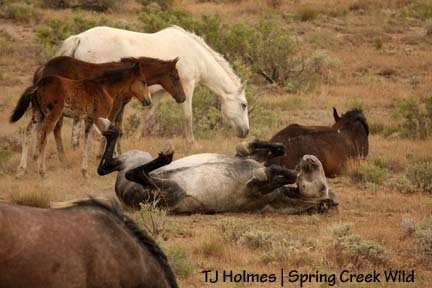 The BLM is calling the Pryor roundup an “emergency” and in its EA (http://www.blm.gov/pgdata/etc/medialib/blm/mt/field_offices/billings/horseeas/2008.Par.13838.File.dat/2008gatherEA.pdf) shows photos of damaged range (in the lower, desert part of the range where few horses summer) and a thin mare (not even shed out and just had a foal). 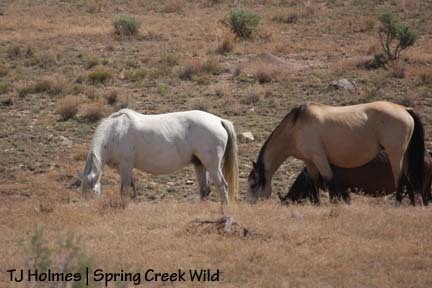 Pam Nickoles, who visited Spring Creek Basin in late May, visited both those ranges a couple of weeks ago and said she has never seen the ranges – or the horses – looking better. I understand this year may be better than next year and the year after that, but to call for an “emergency” gather seems silly in light of the BLM’s financial woes. We had a big rainstorm yesterday evening, complete with long-rolling thunder and scary-close lightning flashes. The rain was lovely in the area around my house, two hours away from the basin. In the basin, it rained hard enough to send gravel across the road in places, and although the road was pretty dry, water was still standing in some ditches alongside. To keep a short story shorter, I spotted Steeldust’s band with the binoculars in an area just off the road, just east of the first intersection. 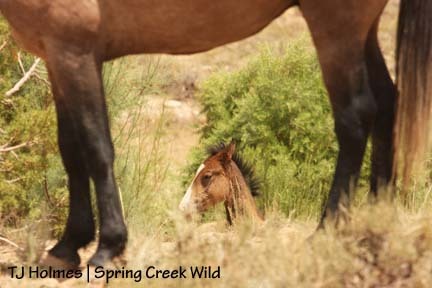 The Spring Creek arroyo was a little gushy after the rain, so I parked there and walked up the road to the horses. My first sighting of Alpha was from far enough away that all I could see was a little shadow by her side! But it was enough to realize she’d had her foal. 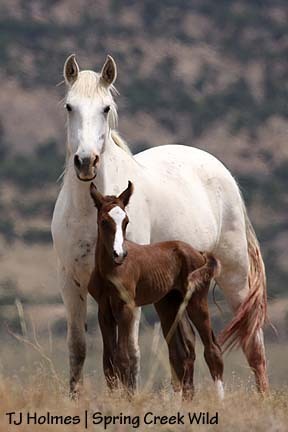 As it turned out, not only had she had her foal, she had it today. 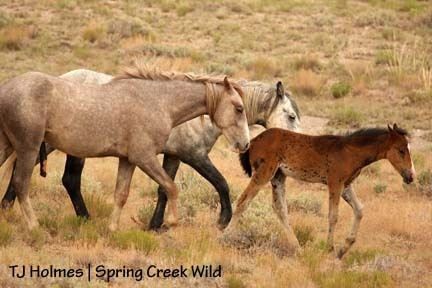 Her back legs and tail are still red with dried blood, which would have washed off in the rain if she’d had her foal before the storm. Pretty amazing. Alpha was really, really good about letting me take photos – better than I expected – so I didn’t stay too long. Baby is chestnut right now (I’m sure he’ll turn grey) with a big, bold blaze that starts in a diamond on his forehead and ends over his right nostril (Alpha’s snip is over her left nostril). 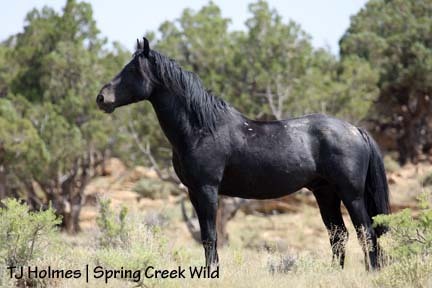 He has long stockings on both hind legs that reach almost to his hocks. 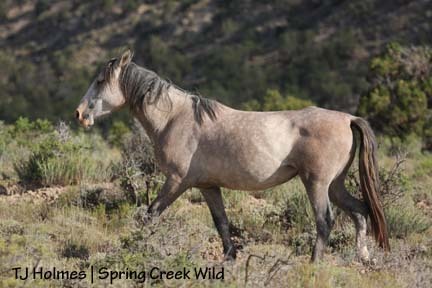 He’s a leggy sucker, and yes, he’s a colt – only the second this year. 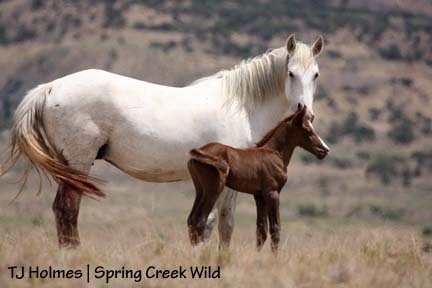 He is the seventh foal born in the basin this season … and in honor of our biggest rain of the summer so far, I named him Storm. He’s strong and healthy and absolutely perfect! This was one of my first views of Storm and Alpha. You can see the reddish hue to her hind legs and tail. 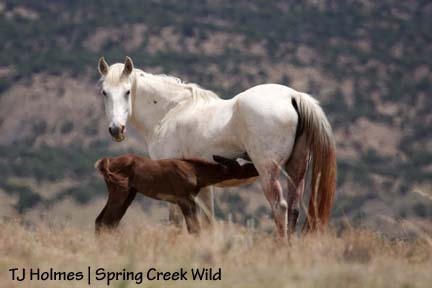 During the short time I spent with the band, Storm nursed a lot – a good sign for this newborn. Look at those curly little ears! Iya’s ears were just like that when she was born. These sisters very often hang out close to each other. Kestrel is a good babysitter. Here he’s trying to get Sundance to play. 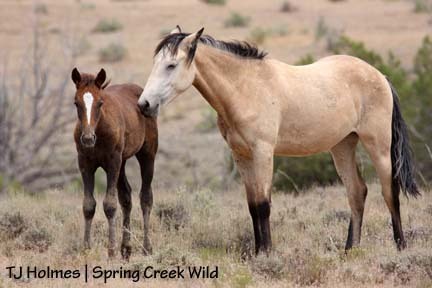 It’s not fair: Pinon can be a brat, but Sundance has to be a big boy and just walk away without hurting the baby. Look how big Pinon looks next to Storm! Pinon is a little older than 2 months now. Ember laid down for a nap, and Storm thought about it … but ultimately stayed on his feet. Ember is a little older than 3 months. Look at the beautiful world our wild baby is born into. 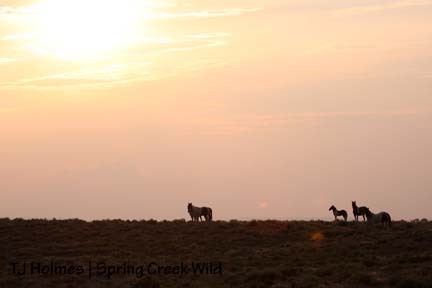 As I left – slowly, ahead of the next advancing storm – I couldn’t help but wonder how long the basin will be a safe place for our Spring Creek Basin herd. … I think? Our girl’s still holding on. Here’s something weird for ya: Today is 11 months to the day from the first day of the roundup last year. Alpha was gathered Aug. 21. Even if she’s not pregnant, the basin is never a bad place to spend the weekend (unless it rains and the road turns to slime). 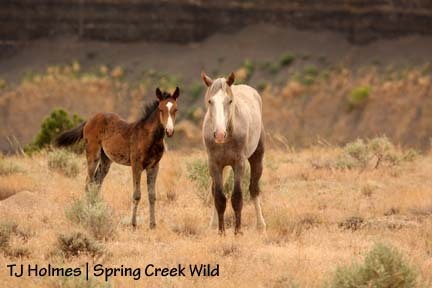 Luna, the buckskin butterball in the photo above, has a filly that’s 3 months old now. She should be pregnant for next year. Most of the ponies look really good. Jif still seems thin; I wouldn’t say she’s 100 percent sound. Molly’s also thin as an older mama nursing a baby, but she’s doing OK. I didn’t see Seven and the girls this weekend except from a distance. I had the good fortune to come across Poco, Bones and Roach both days, and despite her weird hip, she has filled out and looks pretty good. She’s really a cutie, but it’s hard to get a flattering photo of her. Here she’s looking better. Both times I saw the band, Bones was closer to Roach than to Poco, but Poco is definitely the leader of the pack. That prominent outcropping in the background can be seen from almost everywhere in the basin. I’ve never been sure if that’s McKenna Peak or if another, sort of flat-topped “peak” nearby is McKenna. I probably ought to look at a map sometime – who needs a map when you know where you’re going or how to get where you want to go on the wild pony super-highways? McKenna Peak also lends its name to the wilderness study area that fills the southernmost end of the herd area. Poco got rid of most of his spines, it looks like – most importantly, the one right below his eye. I love this guy. He just never gets ruffled. I’m always happy to spot his copper coat against the sage green of some distant hill. Mr. Sundance, just off the road between the two intersections. The ponies were easier to find this weekend and were in the same general area both days. Sundance and Butch look very similar with just subtle differences. 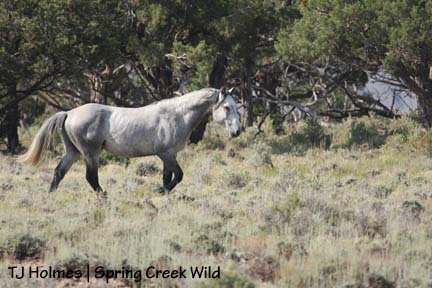 The dapples are a dead give-away that identify this rose-grey boy as Sundance. Daddy’s little girl – Steeldust and Ember. Steeldust is a pretty good band sire. Even though he’s had to be constantly vigilant since April or so, when the bachelors started hanging around, he seems to take it all in stride. 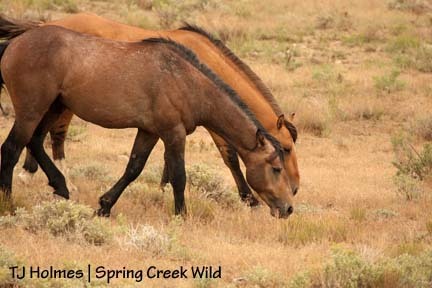 He doesn’t hound his mares, but he’s quick to discourage a bachelor that may get too close to his girls. Pinon, down for a nap, seen through Mouse’s legs. Mouse was waiting his turn at a water seep (being hogged by Butch, Sundance and Luna), and I sneaked this photo from just off the road. 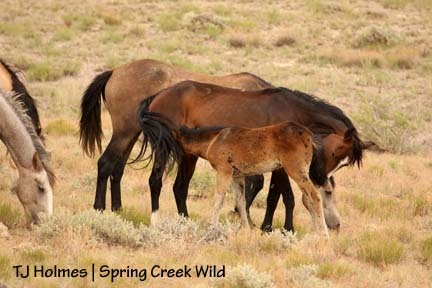 Family is the most important thing to wild horses. 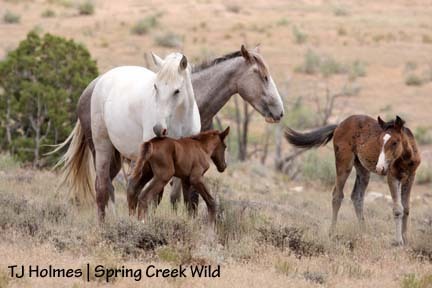 Sure, they have their disagreements – when Luna thought Butch and Sundance had had enough from the seep, she pawed at them to move them along – but what I love the most is that the youngsters – yearlings Baylee and Kestrel and babies Ember and Pinon – are as comfortable with any horse in the band as with their own mothers. Grey/Traveler and his band are roaming around his old home territory, and they seem to keep the water catchment at the center of their wanderings. Bounce and Alegre were elusive Saturday, but they were out in the open today back in the east. The pintos were down in the meadow by the county road near dark, and at least a couple of the bachelors – Ty and Mesa? – were nearby. No rain yesterday, but it was crazy-windy last night. Lightning flashed sporadically to the west and south, but nary a drop of rain did we receive in the basin. Today, I stood in the sunshine while random drops of rain fell from a huge dark cloud directly above us! By around 2, the clouds were building, and I judged it might be time to head out. I was going to go the back way – to the Dolores-Norwood Road to Dolores – but it looked pretty wicked that way, so I went the highway instead. I mention this because as I was driving up the switchbacks from Slickrock and the Dolores River canyon, I looked back toward the basin. In the middle of a vast purple curtain of rain, a giant spotlight beamed through the clouds – right onto my beloved Spring Creek Basin. God must love the wild ones as much as I do. As if I needed such a blatant sign. If one picture is worth a thousand words, the wild ones have filled me for a lifetime and beyond. So here are a few favorite photos from the weekend to fill you, at least until next weekend. Alpha seems perfectly content and in absolutely no hurry to have her foal. Alpha laid down and rolled, and this is one in a sequence of photos I took of her getting back to her feet. That’s one big belly. Hollywood, having successfully “wooed” Piedra and won her favor, now takes his duty to protect her very seriously. Mouse, meanwhile, doth protest. There’s a definite pecking order to the bachelors, and Mouse is on top. 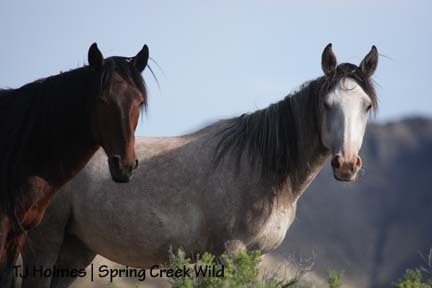 He gets the closest to the band, and his closest pal, Comanche, is allowed to get next closest. When they’re bored of standing around napping, Steeldust and Hollywood will go out and tease the bachelors, nibbling and sniffing, but never letting them anywhere near the band. Does Pinon look slightly annoyed? 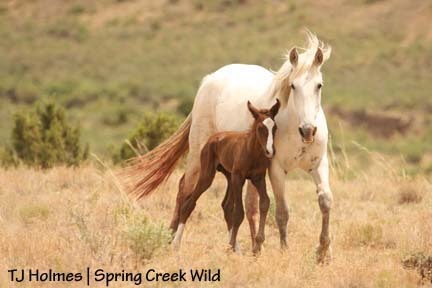 His mama is just another step ahead of him, but he must have thought Steeldust (daddy) and Sundance were crowding him. Look at those ears and curled lip. Pinon takes a lunch break. Ember and Pinon seem to find Steeldust’s and Mahogany’s ground-level antics entertaining. 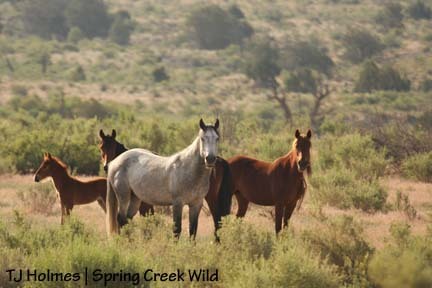 I found Kiowa, Spook and Chipeta with the rest of the pinto family just before sunset. They like to come down into a little “meadow” near the county road at dusk. I saw them one evening when I was leaving the area, so I checked the area Saturday, and sure enough, there they were. I’m really glad of every chance I have to see this band; they’re one of the most elusive. The pintos went back up on a ridge, and I took this last shot of them at the end of the day. 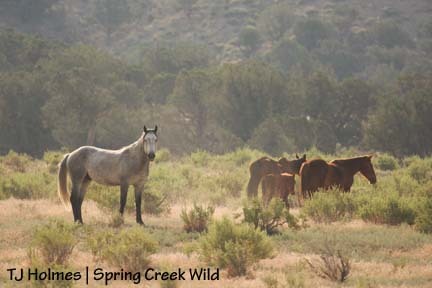 Around 8:30 a.m. Sunday, Seven and his band were near the dry water hole off the doubletrack. Beautiful light illuminated the horses. Molly is thin, but she’s feeding her baby well. The band didn’t find water at the pond, but they did find it in an arroyo a bit south. Bounce, Alegre and Gaia were above the road on one of those little hills around the loop in the east. Bounce took an intense interest in something just out of sight, but I didn’t see anything. Maybe, like a mother bird that will feign a broken wing, his feigned interest is meant to throw the observer off the trail so Bounce can lead his small family to safety. Alegre is usually quick to leave, but she didn’t seem too worried about me … maybe because of their height advantage. Pretty girls. All the babies are still pretty fuzzy, but it’s interesting to watch their colors. I think Gaia, Ember and definitely Iya all will lose their sorrel coats and turn grey eventually. During the weekend, I saw all the horses except Poco, Bones and Roach. It rained Saturday evening, but I did make it once around the loop. I was hoping to see Poco and see if he managed to get rid of the cactus spines in his face, but I never saw those horses. I was surprised to see that the water hole below the roller-coaster ridge road still has quite a bit of water. The coolest photos I did NOT take this weekend: a bobcat that crossed the road ahead of me as I was leaving the basin to go down and check on the pintos, and two rattlesnakes – one coiled, one slithering – on the road in the dark. I looked at them with a flashlight from the safety of the Jeep. Youngsters, I think, with just a couple of buttons each. Is it killin’ ya? It’s driving me crazy! Not yet, folks. Not yet. Some other good news to tide you over: The basin got some good, lovely “female” rain yesterday evening, and given the “iffiness” of some of the arroyo crossings, it has been raining some out there. It doesn’t seem like much, but we’ll take it. Also, Grey/Traveler and his band have found the water tank by the catchment! I’ve seen them in the vicinity twice now, and there are fresh tracks around the bigger of the two tanks. 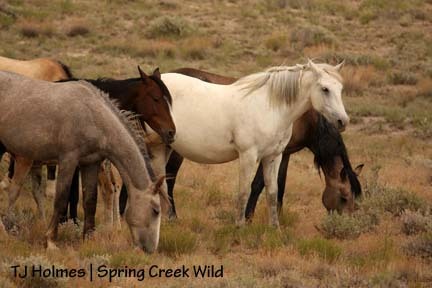 For one thing, this discovery means they’re getting some fresh water, and for another thing, it means the bands are dispersed a little more than they have been all spring and spreading out more to graze. As for Alpha, she’s big as ever, and her udder looks full. 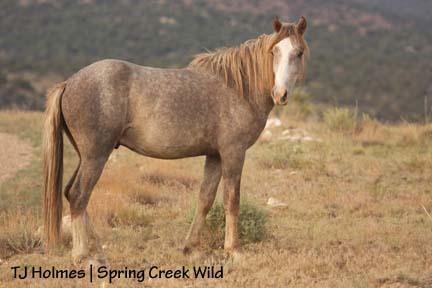 She gets snappy at the two young stallions, Butch and Sundance, and she has started to wander off by herself a short distance – but then she seems just as happy in the middle of the band – and Steeldust seems to be keeping a close eye on her. Signs or just my imagination? If it’s true that good things come to those who wait, we’re in for a treat! 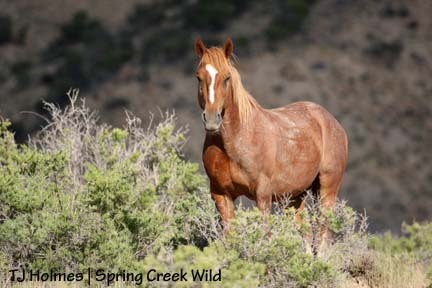 I became aware of it this afternoon when I received an email from the American Wild Horse Preservation Campaign. 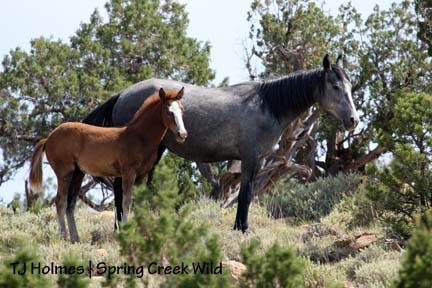 It is signed by Rep. Nick Rahall of West Virginia, chairman of the Committee on Natural Resources, and Raul Grijalva of Arizona, chairman of the Subcommittee on National Parks, Forests and Public Lands, and it is addressed to Henri Bisson, deputy director of operations for the BLM. He’s the guy who made the announcement at the National Wild Horse & Burro Advisory Board meeting that the BLM just has to start killing horses. Please take a few moments and read the letter. 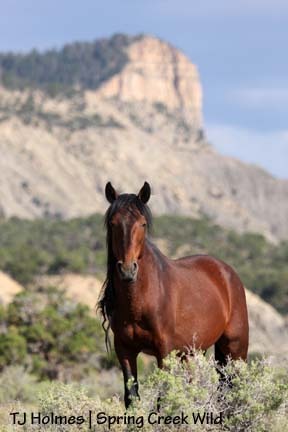 A local nonprofit group that partners with San Juan Public Lands here in Southwest Colorado will host “Pony Up Month” in August. 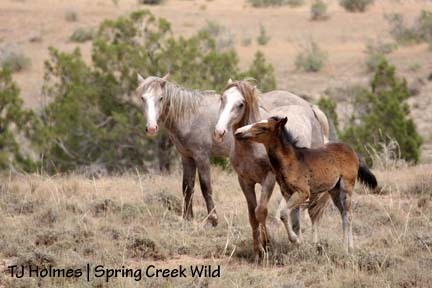 The San Juan Mountains Association has all sorts of things going on, Claude Steelman will show off his new, excellent book, “Colorado’s Wild Horses,” and a local brew pub is setting aside a portion of its beer sales during the month of August to go toward our Spring Creek Basin horses. 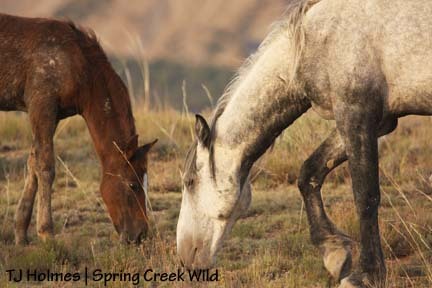 Check out this Web site – http://www.sjma.org/whoweare/news/ponyup.htm – for more information. 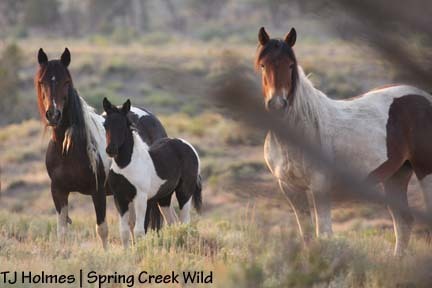 The planning for this event started months ago, but in light of recent “decisions” by the BLM, it seems especially timely in our effort to save our wild horses.